Bean Sidhe (pronounced ban-shee) proformed at the Music in the Mountains concert series in Bryson City, NC. In an acoustic session Larry and George play a variety of instruments. With traditional songs like Fandango, Midnight on the Water, Jacky Tar, Soldier's Joy and more, you will hear them played on guitars, mandolin, fiddle, banjo and even a hand held accordion. A pair of sisters is the core of this Old Time Band. The Forge Mountain Diggers came into the studio and kicked out seven foot stomp'in tunes. This is old time mountain music the way we like it. 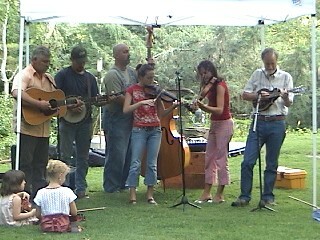 The Freight Hoppers kept the crowd entertained at the Forth of July Freedom Fest in Bryson City, NC. Frank Lee came into the studio and brought his unique collection of banjos. This is bluegrass at it's finest! If you listen to bluegrass music you've probably heard of Pine Mountain Railroad. This Knoxville, TN based band's latest CD "Heartache and Hope" has reached number nine on the bluegrass charts and hit single "beyond the Rain" Has reached up to number four at the time of this video. With a song that reached to #1 on the bluegrass gospel charts, this Bryson City, NC band has become very popular in the western North Carolina area of the Great Smoky Mountains.